the global set-top boxes market is anticipated to rise in the market in the coming few years. According to a report by Transparency Market Research, the market will witness change in its competitive landscape in the coming years due to shift in the market. The market is now consolidated but is witnessed to be highly fragmented in the coming years due to entry of regional players in the market. Major players in the market are engaging in research and development to implement new technologies and software. There has also been alliances and collaborations between manufacturers of set-top box and paid TV operators. These regional players will be taking up three quarters of the market during the forecast period of 2015 to 2022. Some of the key players in the global set-top boxes market are Echostar Corporation, ARRIS Group, Inc., Cisco Systems. Inc., and Pace PLC. The global set-top boxes market revenue is anticipated to grow at a healthy CAGR of 6.4% during the forecast period between 2015 and 2022. The global set-top boxes market was estimated to be US$16.6 bn during 2016 and is expected to rise up to US$24 bn by the end of forecast period. The global set-top boxes according to segment type is dominated by cable set-top box and is expected to lead in the future. This segment is expected to reach US$7.12 bn by the end of 2022. Among all regions, Asia Pacific is anticipated to be the largest as well as the fastest growing region in the global market due to increased rise in demand. Asia Pacific is expected to generate revenue worth US$9.72 bn by the end of the forecast period. The rise in demand for high definition (HD) and ultra-HD channels has led to rise of set-top boxes in the market. Set-top boxes possess the ability to provide a variety of channels to its viewers. This is one of the major factor for the shift to set-top boxes in the market. Technological advancement leading to interactive features and digitalized set-top boxes will lead to rapid growth in the market. Hybrid set-top box, which is comprised of satellite based and internet based TV services will act as primary factor for the rise of the global market. Rise in awareness among consumers in the developed economies has led to adoption of HD services in almost every other home. Introduction of HD channels and HD TV in the developing and emerging economies have also fueled the market. The rise in demand for high definition services has led to rise of production of set-top boxes. 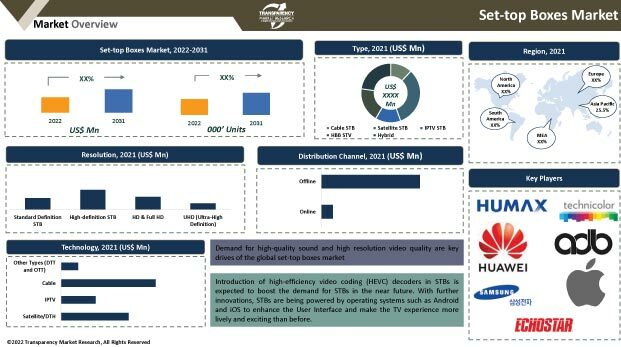 Improved standards of broadcasting services by various providers has helped in the revenue growth and favorable grounds for set-top boxes market globally. The rapid growth of digitalization across the world is expected to help significantly in the growth of global set-top boxes market during the forecast period. The global set-top boxes market is expected to face few restrains in the growth during the forecast period. The rise of over the top services provided by mobile devices and PC are expected to hamper the growth of the market. Increased cable card providers is also expected to affect the market growth during the forecast period. Internet’s ability to provide almost every and anything at any time will hugely impact the growth of set-top boxes market.